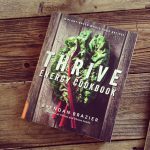 The Veggie-Lover’s Sriracha Cookbook: Review & Giveaway! Once upon a time, I worked in a cheese shop where I worked with a multitude of interesting, yet wonderful characters. Though I don’t work there anymore, nor would I want to, I left with a great collection of friends. One of these friends is Randy Clemens. 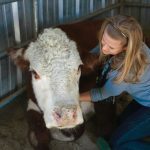 You know him as the author to The Sriracha Cookbook, the co-author to The Craft of Stone Brewing Co., and contributor to Edible Westside (as well as a number of other publications). I know him as the very kind and generous co-worker with the awesomest hair ever who would always bring in tasty, homemade treats for us to try. We also co-starred in an episode of the hit show Rob Dyrdek’s Fantasy Factory *. Ok, it was only about 30 seconds of the episode but still, we were positive that this was our big break. I was sure I was going to get a call any day to be the next Bond girl. I’m still waiting for that call. Randy, however, went on to do big things and his newest book, The Veggie-Lover’s Sriracha Cookbook, is hitting shelves on July 2nd. Why am I so thrilled about this book? Well, firstly, I am a member of the cult that worships Sriracha sauce and I love finding new and unique ways to use it. The all-vegan book comes out the day after my birthday so it feels like a gift from the publishing gods. The book release party is on July 2nd too, in Los Angeles, with tons of Sriracha-laced eats being served so of course I’ll be in attendance! I was also a recipe-tester for Randy’s new cookbook and I’ve had a chance to sample the excellent SriraCHILI Non Carne which Randy entered in the Los Angeles Vegan Chili Cook-Off last year. I was very impressed by the recipes I had tried, however, I was astounded when I saw some of the other recipes in this book: SriRANCHa Dressing and Dip, Beer Battered Fried Avocado Tacos with Sriracha Curtido, Sriracha and Green Onion Biscuits with Country Mushroom Gravy, and Maple-Sriracha Doughnuts just to name a few! I’ll pause while you clean your drool off your computer. Now if you think Maple-Sriracha Doughnuts sounds good, wait until you hear about one of the recipes I got to test: Pumpkin-Sriracha Cheezecake with Chocolate-Pecan Crust. 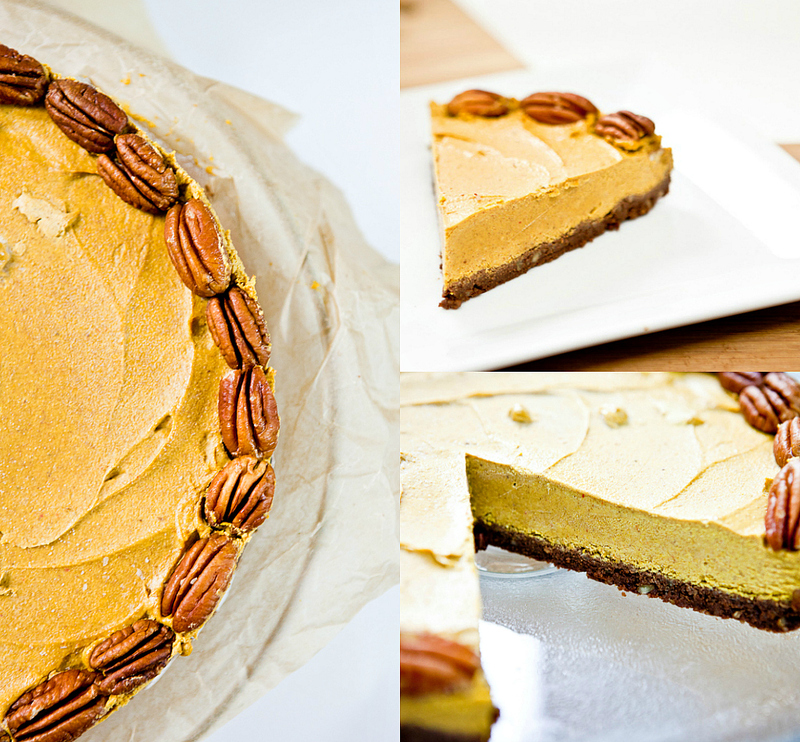 Sweet, spicy, nutty and absolutely delightful. Plus, it’s super easy to make and doesn’t require any baking! Chris gets a little weirded out by sweet and spicy things, but I love them. I would be lying if I said I didn’t pull the cheesecake out of the fridge several times a day just to cut off the thinnest sliver of cake (to even the lines out, I lied to told myself). This treat was tough to beat, but I actually loved the other recipe I tested a little bit more: Jackfruit “Pulled Pork” Sammiches with Pickled Red Onions. Where to begin with this sandwich sammich? The jackfruit is so juicy (without being watery) with a deep barbecued flavor and it pushes the spicy meter to the max. If it were any more spicy, I might have cried, but it was just perfect. Once it’s stuffed in a bun with some freshly sliced avocado and pickled red onions… Oh, those pickled onions! It was my first time making them and they started a serious obsession. I know a recipe is good when I make it more than once and I’ve made variations of this sandwich several times since then. 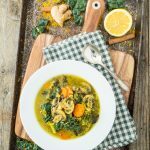 Randy and Ten Speed Press were nice enough to let me share this recipe with you all- I hope you love it as much as we did. To make the pickled onion, put the onion in a large saucepan and add water to cover. Bring to a boil over high heat. Boil for 1 minute, then drain well. Transfer to a small bowl or a glass jar. In the same saucepan, combine the vinegar, sugar, salt, and peppercorns. Bring to a boil over high heat, then immediately remove from the heat. Pour over the onion. Let cool to room temperature, then cover and refrigerate for at least 1 hour before serving. Stored in the refrigerator, it will keep for 1 month. To make the “pulled pork,” preheat the oven to 350°F. Heat the oil in a large cast-iron or nonstick skillet over medium heat. Add the onion and sauté until softened, 5 to 7 minutes. Add the garlic and sauté just until fragrant, about 30 seconds. Add paprika, cumin, and mustard and sauté until the spices are toasted, about 3 minutes. Add the tomato paste and cook, stirring constantly, for 1 minute. Stir in 1/4 cup Sriracha, the water, and the brown sugar. Bring to a simmer, then lower the heat, cover, and simmer for 5 minutes. Uncover and cook, stirring occasionally, until the mixture has the consistency of barbecue sauce, about 4 minutes. Remove from the heat. Taste and add more Sriracha if desired. Drain the jackfruit and rinse under cool running water to reduce the saltiness. Transfer to a large bowl and use two forks to pull the jackfruit into shreds. Add the Sriracha mixture and toss until the jackfruit is evenly coated. Transfer to a nonstick or parchment-lined rimmed baking sheet. Bake for about 20 minutes, until the jackfruit firms up and the sauce dries slightly, adhering to the jackfruit. Season with salt and pepper to taste. 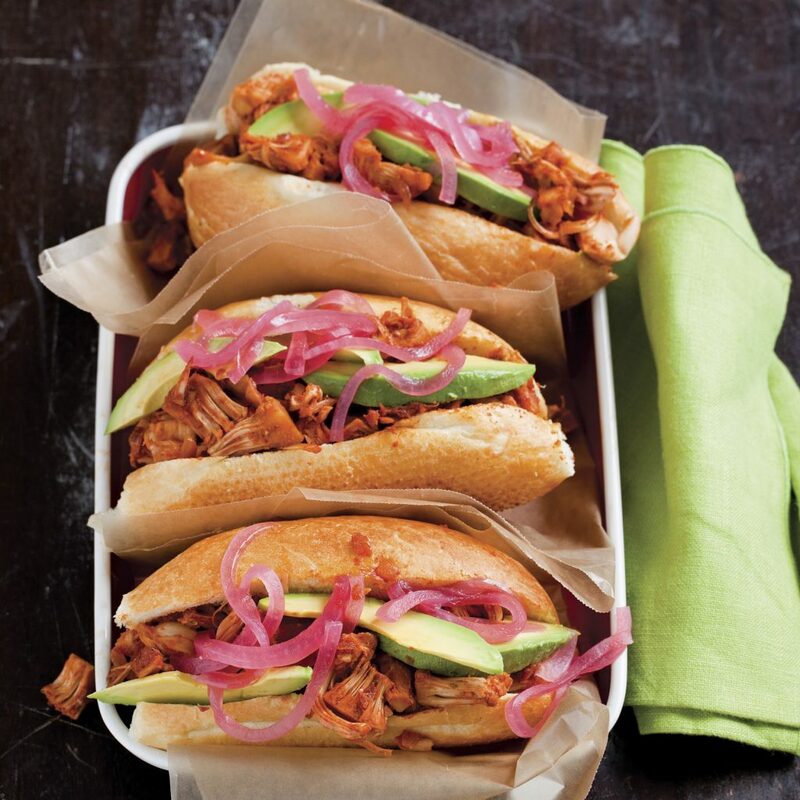 To assemble the sandwiches, divide the “pulled pork” among the buns. Top with avocado slices and pickled onion. Serve immediately. Substitute gluten-free hamburger buns, or wrap the “pulled pork” in gluten-free tortillas or large leaves of iceberg, Boston, or Bibb lettuce. 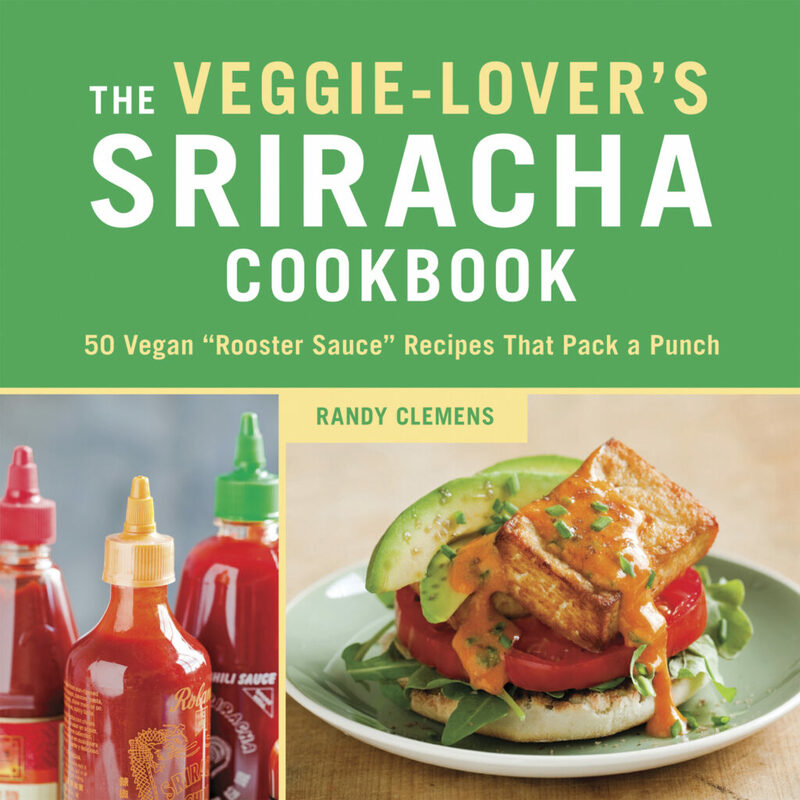 Randy and Ten Speed Press have also been so generous as to give me one copy of The Veggie-Lover’s Sriracha Cookbook to give away to one of my amazing readers! There are several different ways to enter- just follow the instructions in the box below. The contest will run until midnight on July 2nd and I will announce the winners on July 3rd. If you want to be sure that you don’t miss out on this awesome book, you can pre-order it on Amazon right now, or if you are in the LA area on July 2nd, you must come to the book release party and get yourself an autographed copy. The party is at Chloe’s, the semi-private club at Golden Road Brewing. According to Randy, “We’ll have tasty grub and splendid beers to fill your mouth-hole, and sweet bluegrass tunes to serenade your ears… The event is free to enter; food and beer are available for purchase à la carte. There will be a list of suggested Golden Road Beer pairings and a TBA Sriracha-infused DESSERT.” I’m going- who’s with me? Thank you so much to Randy for allowing me to test recipes for The Veggie-Lover’s Sriracha Cookbook and also to Ten Speed Press for allowing me to share one of these fabulous recipes and supplying me with a copy for one of my readers! *I’m not including the link to the actual episode because our scene is from an episode titled “Cheese Ballers” and when watching it again as a vegan, the amount of cheese in our scene made me sad. If you still want to see it, by all means, go look it up, but be prepared to look at a lot of cheese. Disclaimer: I was given a copy of The Veggie Lover’s Sriracha Cookbook but all of the opinions are my own. 88 Responses to "The Veggie-Lover’s Sriracha Cookbook: Review & Giveaway!" on top of a salad! I’ve started putting sriracha into my morning (savory) oatmeal. Tasty! All the best people are born in July!!! 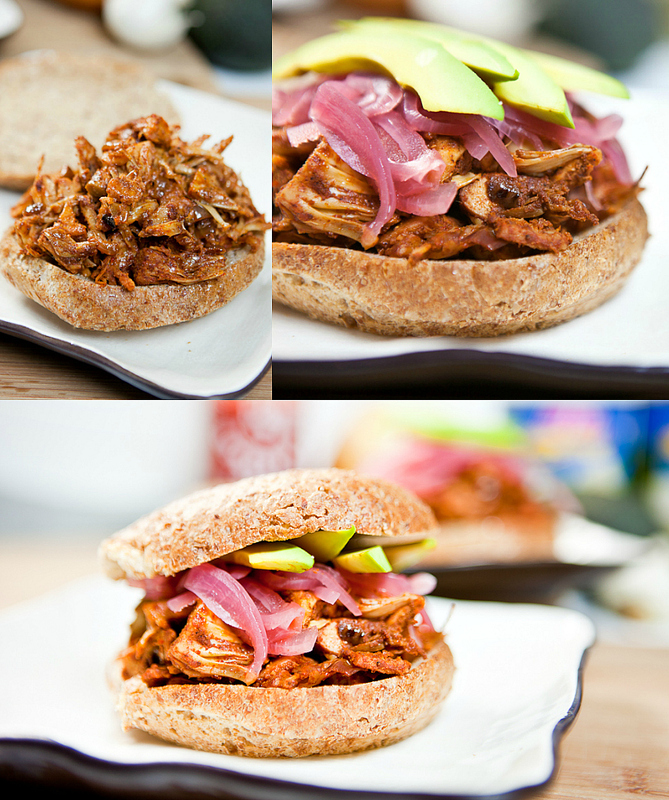 That jackfruit pulled-pork recipe looks ah-ma-zing! Wish I could get hold of jackfruit in the UK! You can order Jackfruit on line ! It’c canned ! I put sriracha in anything that’s too boring. I love it in scrambles tofu. I also like to have a sandwich with just avocado sprinkled with salt and pepper and some sriracha. Wow, cake?! That’s adventurous! Where did you find the jackfruit? I just found it canned at a local asian market. Adding it to tofu to make spicy tofu sushi rolls!! Anywhere I would have used ketchup, it’s sriracha now! My favorite way to use Sriracha is on stir-fried rice noodles. Sriracha as salad dressing, Sriracha in miso soup, Sriracha is married to my hand! But one of the best uses of this magical sauce is as a dressing for crudites. Chop up veg. of choice, drizzle on tahini (to taste – and while we’re at it, tahini is married to my other hand …), then squirt on a generous amount of Sriracha. You’ll never look at crudites the same way again. I have to get the cookbook! I feel like it was made for me. haha Current fave way to eat sriracha: on avocado toast with cilantro. Simple but amazing! This cookbook is so clever! I can think of quite a few people who will love it. oh my dear, this post had me drooling before i even reached the first photo! i do love my sriracha, especially with my sunday morning tofu scramble! i knew there was a reason i stocked up on jackfruit recently…. I love sriracha on yakisoba noodles – yum!! I use sriracha on everything, but I’ve been loving it on (vegan) pizza lately. My favorite way to use Sriracha is with peanut butter for a sweet and spicy sauce. I love to add sriracha to maple syrup and serve it over chicken and waffles! I’ve been hearing about using Jackfruit this way for a while, but I still haven’t tried it! I love to douse my tofu scrambles with sriracha! Lizzie recently posted…Two recipes using my favorite veggies! I love the combination of avocados and sriracha and adding both of them to sandwiches! I love using sriracha in bean and veggie wraps! Wow. 1/2 cup of sriracha! It sounds delicious. 🙂 Thanks for sharing the recipes. I love to add sriracha to soup. I use sriracha on almost everything…probably my favorite use is to mix it into chili. While pretty basic, I find that the extra flavor in sriracha (as opposed to just plain heat) adds so much depth to a dish like that. I love to put sriracha on anything and everything. I never go a day without eating it, yum! I love sriracha on top of avocado toast or in stir frys… yum! Surprisingly, I love it on pizza! My favorite way to eat sriracha is on pizza….Yum!! Mashed up with cold tofu, nutritional yeast, and pepper, because I’m a little bit odd. Atop tofu scrambles, stir-fries, etc. Anywhere, really! I love sriracha mixed with vegenaise as a dipping sauce for anything! I love using sriracha on popcorn and in vegan mac & cheese. So good! My favourite way to use sriracha is as a garnish on pizza! OOOhhhh.. Countless ways.. I love to spice up my sweet potatoes with sriracha! I love to mix sriracha in cashew cream sauce! I like to mix it with store bought vegan ranch. Makes it much yummier! I love to use Sriracha in my lentil sloppy joe’s! I love the Sloppy Chicks recipe!! 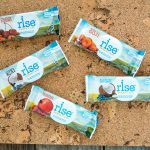 I mix it with vegenaise and put it on top of a spicy boca chick’n patty with avocado! I love it in noodle soups! definitely put sriracha all over my vegan mac n cheese!!! Now this is my kind of book! i cant imagine how delicious that pie must be. hmm i think i am loving a good load of sriracha in my chickpea omelette batter! I love siracha on top of vegan sushi! I like it with steamed bokchoy. In Michael Symon’s Tomato Soup recipe. I love it on mashed cauliflower. I love sriracha in a tofu scramble! I often add sriracha to soups! 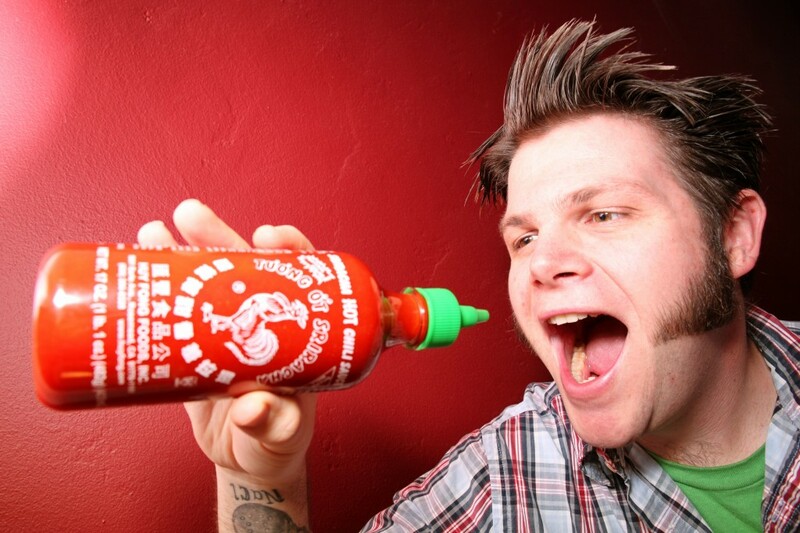 I love Sriracha on everything (well, almost everything) esp love it on Banh Mi sandwiches! thanks for the chance to win! My favorite way to use sriracha is on anything that could use a nice kick and with potato chips! Thanks for the chance to win! On top of tofu, rice, veggies, kale, and definitely on top of chilis and soups. I love kicking up the spice! I put sriracha on absolutely anything, I love the extra kick especially on something kinda boring like a salad wrap or unexpected dish like a soup! I love sriracha in spicy peanut noodles! I use sriracha most often to give my soups a kick, but I also love it on my tofu scrambles. I love to squirt a ton of sriracha into my sweet potato hummus! I like it on everything!! I love hot and sweet together,like i put Cayenne pepper in everything…like I mean EVERYTHING! But i was just wondering…doesn’t the garlic clash with the sweets?